With the sun shining on the Ocean Beach lifeguard tower, Mayor Kevin Faulconer on Wednesday showed off two new electric charging stations just steps from the Pacific Ocean amid a citywide expansion. The city has increased the number of public charging ports from 32 to 68 and expanded to 15 locations from Otay Mesa to Rancho Bernardo. A complete list of stations is online. Increasing the number of charging stations is part of the city’s climate change plan adopted at the end of 2015. The latest boost was funded by a $500,000 state grant in partnership the Center for Sustainable Energy. 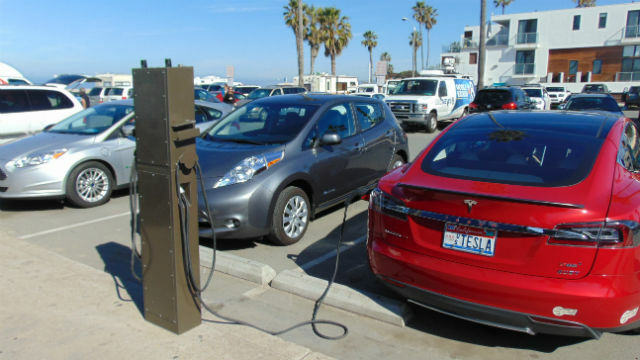 Last month, San Diego Gas & Electric proposed a massive expansion of its own charging stations. In filings with the California Public Utilities Commission, SDG&E proposed installing tens of thousands to encourage the transition to zero-emission vehicles. City Councilwoman Lorie Zapf, who represents Ocean Beach, said residents of that community are “some of the greenest, most thoughtful stewards of our environment” and challenged other neighborhoods to encourage electric vehicle use. There are now some 13,000 electric vehicles on the road in San Diego, making the city a leader in this area. “Move over Portland, San Diego is growing greener and we’re growing smarter,” Zapf said.